New comfrey macerate, super-fresh, luscious green, full of goodness - our comfrey oil (macerate) from this years May 2018 harvest. In ancient times comfrey was called 'knitbone',' all heal' or 'woundwort' and was used topically for healing cuts, bruises, fractures, sprains, injured tendons/ligaments, sores and skin ulcers. On the skin, it is an emollient, soothing and was used to heal scars and blemishes. It was also said to promote a youthful complexion. The Latin name 'symphytum' means 'heal together'. It is now believed that the allatoin (a main component of comfrey) is responsible for the growth and multiplication of skin cells. Wild-crafted comfrey (symphytum officinale) macerated in organic sunfloweroil (helianthus annus). Made from the May 2018 harvest. The comfrey is gathered from private ground in rural Aberdeenshire and only the best flowers, leaves and roots are used in the macerate, to give optimum potency. All processes are undertaken by hand - no mechanical extraction. From field to container is all undertaken in one day to ensure ultimate freshness, and then the sunflower and comfrey are left to slowly macerate until all the goodness is transferred to the oil (rich green in colour with a slightly herbal scent). "how absolutely gorgeous this wonderful new fresh comfrey macerate is, i shall so enjoy using it!" H Seagle, Portsmouth. 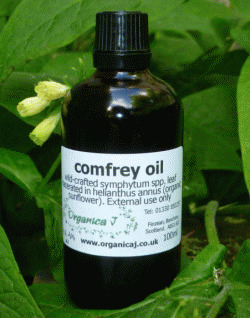 "I am using your comfrey oil and comfrey ointment for joint pain and it works wonders" D Morris, Plymouth, Devon.